Winner of the Indie Book of the Day, September 2013. Witty, Intriguing and full of stories and curiosities worth reading. Called everything from the world’s richest to fattest nation, Qatar has been on the breakneck path towards change for several decades. The capital city Doha, is where our family of three has lived since 2005. 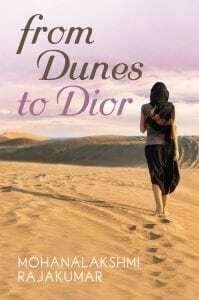 FROM DUNES TO DIOR is not the stuff of newspaper headlines (they made their money from oil! Thirty years ago everyone was living in tents!) but real life stories about being a South Asian American who lives here (no, I don’t have to cover my hair, and yes, I can drive). I had no idea that living the life of my dreams (including a husband and two precious babies) would coincide with the rapid development of one the smallest and safest countries in the world, an oasis of calm smack dab in the global hotspot of the Middle East.